This family-run business, that inherited from the Basque savoir faire, offers a wide range of traditional products made in a newly-built cannery. This producer, key player in the Espelette pepper processing activity, subtly adds a touch of the precious “red gold” to each of his recipes. This beloved spice from the Basque Country has learned how to win over prestigious tables and blends with the most unexpected flavours to always bring this irreplaceable and slightly seasoned aroma. 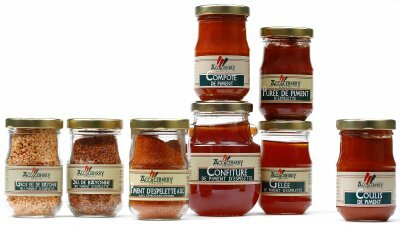 Espelette pepper in flakes, coulis, compote, jelly… in glass jars.